If you came off the 11th with the necessary score to keep the card going, the twelfth is another real test of ability. This time a dogleg to the left, with out of bounds down the left for three quarters of the length of the hole. A bunker comes into play for those that decide the tiger line is the way they intend to play this hole, masking a large hollow that is behind it. There is plenty of room right, but this makes the green that much further away for the next shot. The second shot, if the green is the target, is as difficult a shot as there is in golf. 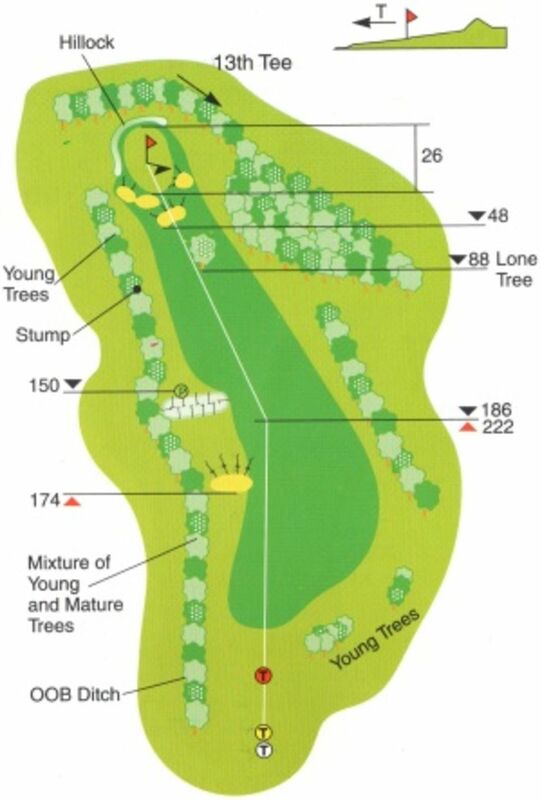 An oak tree, to the right centre of the fairway, beyond which slightly more central is a green protecting bunker that leaves a twenty yard landing area before the green. Large trees intimidate the shot that may try to come in from the right. The green has two flanking bunkers, one right and one left, with slightly rising mounds around the outer perimeter. It runs ever so slightly back to front and from left to right, making some putts extremely tricky for speed and the obscure borrow in certain places.